Most of Connell’s brigade continues to retreat, but fragments of Buell’s brigade rally at the foot of the ridge below the massed artillery. 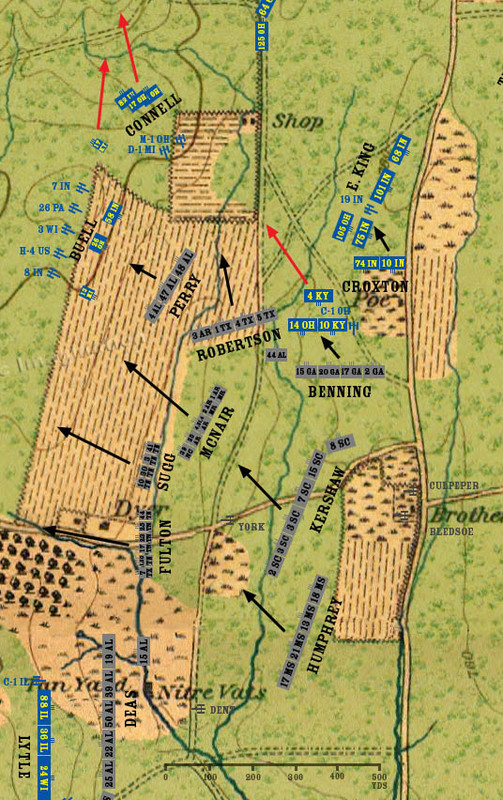 Perry’s brigade advances directly toward the batteries, although the 44th Alabama is left behind to cover the brigade right flank. Robertson’s Texas Brigade moves past Perry’s right toward the knoll occupied by Battery M, 1st Ohio and a gun from Battery D, 1st Michigan. Johnson’s Division enters the field to the south, threatening to outflank the batteries. Brigadier General McNair is wounded by artillery, and command of the brigade is take up first by Colonel Robert W. Harper commanding the 1st Arkansas Mounted Rifles (dismounted), but he is killed almost immediately. Command of the brigade then falls to Colonel David Coleman of the 39th North Carolina. At the Poe house, Benning routs three regiments of Croxton’s brigade and Battery C, 1st Ohio. Colonel Croxton is seriously wounded, and command passes to Colonel William Hays of the 10th Kentucky. The 10th and 74th Indiana briefly remain behind a fence to the north of the burning Poe house, but soon retire intact behind the lines of Reynold’s division. Kershaw’s division wheels to the north, following Hood’s Division.